Truth be told, againn translates to “at us” or “with us.” And if someone had told these two food bloggers, “Today you’ll eat a radish topped with butter that tastes like cheese, and you’re going to love it,” we might not have believed them. Well, OK, we do love butter, so maybe it’s not that far-fetched an idea. But atop a radish? That stroke of awesome from AGAINN’s executive chef, Wes Morton, really made our day. 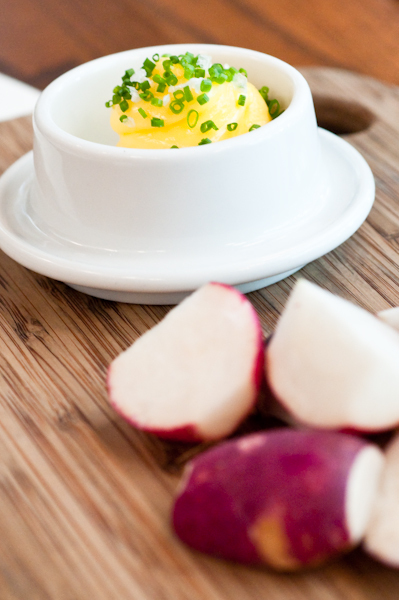 The Farmstead Butter was truly the icing on the cake radish. With about 15 other food writers, we attended a spring media luncheon at the downtown D.C. restaurant that we profiled in two parts a couple of months back. 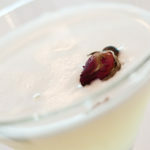 To start, AGAINN’s head bartender, Rachel Sergi, created the Lady Macbeth cocktail, a gin-based drink topped off with rose water. It has a distinct taste that is just incredible and indescribable. Try one. Trust us. We’re amazed at Sergi’s talent; she’s truly a master mixologist. 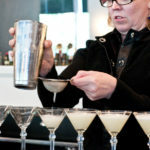 She’s come up with other inventive drinks such as the Earl Grey infused Saint cocktail – black and gold, created in honor of the NFL team’s recent Super Bowl win – that tastes like an Arnold Palmer with a kick. Lightweights that we are, we had a few sips of the spirits served with each course, as the pairings complemented the meal – beer with the vichyssoise, white wine with the salmon, and single-malt scotch with the rhubarb dessert. Stacey went from not knowing what the word vichyssoise meant to cooking it at home two days after the luncheon. Not a fan of gazpacho, she wasn’t so sure about enjoying a chilled soup, but she was wrong. 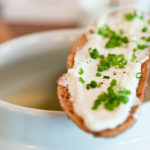 Served with a creamy goat cheese spread on toast, the creamy leek-potato soup was the perfect start to the meal. Next, the pan-seared Scottish salmon was cooked to perfection. It was served with peas from a farm in neighboring Pennsylvania; big, fat peas that popped in your mouth when you took a bite. Did we mention that the peas were cooked with bacon made in-house? Pastry chef Genevieve So served a rhubarb syllabub for dessert with crème Chantilly and black pepper shortbread. The shortbread was such a surprising treat! We contemplated asking our neighboring diners, “Are you gonna eat your cookies?” but realized that would have been poor social etiquette. In all, it was a fantastic meal, with a surprise at the end. Chef So sent each of us home with a jar of handmade strawberry rhubarb preserve. Not to send you away empty handed, Dear Reader, we’re sharing the recipe with you! Cut 2 pounds rhubarb into ½” pieces and combine with 3 cups sugar. Let marinate for 1-2 hours. Mix another 3 cups sugar with 1 packet natural pectin and 1 vanilla bean, and reserve. Cook marinated rhubarb over stove until pieces are soft and broken, about 15 minutes. Add 2 pounds quartered strawberries and sugar/pectin/vanilla mix into pot and continue to cook down and reduce, constantly stirring for about 15 minutes. Deposit hot jam into sterilized hot jars, seal and turn upside down to cool. UPDATE – Stacey modified the recipe slightly to cut down on the sugar and firm up the concoction. To save time, she got two 10-oz. bags of frozen, cut rhubarb in the Whole Foods freezer case, defrosted them and combined with 2 cups sugar instead of 3. She also saved money by purchasing fresh frozen strawberries for $1.69/pound that she then defrosted and quartered. Have you eaten at AGAINN in D.C? Did you know that they’re opening an AGAINN Tavern this June in Maryland at 12256 Rockville Pike in the Towne Plaza Shopping Center? Tell us what you think! 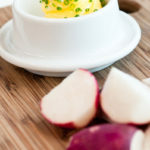 We looked at Againn for a last minute trip to DC’s Penn Quarter but ended up at Oya instead.Great post and interview!